Rocco J. Engongoro, 94, of Stamford passed away peacefully on Thursday, Jan. 24. Rocco Encongoro, 94, passed away on Jan. 24. His wake will be on Monday, Jan. 28, and his funeral on Jan. 29. He was born in Port Chester, New York on Nov. 4, 1924 to the late James and Angelina Scilla Engongoro. Rocco was a veteran of World War II in the U.S. Army. After serving his country, he decided on a career in landscape services in 1950 and started working for a local landscape company in Darien. In 1956 Rocco decided to make his own way in life and started his own company, called Roccie’s Asphalt Paving until 1998. After his retirement, he enjoyed spending time with his grandchildren, great grandchildren, and his many friends, as well as cooking fabulous meals. He also enjoyed woodworking, gardening, and was an avid fan of the Yankees, Giants and UConn Women’s Basketball. 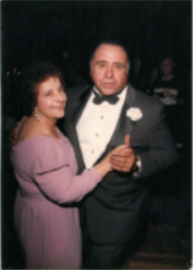 Rocco has been a longstanding member of the Piedmont Club and the Old Timers Athletic Association of Darien and was an avid ballroom dancer attending many social functions at local organization based events. He is survived by his loving son, Vincent Engongoro and his wife Emily of Westport; his four grandsons: Matthew Wallman of Norwalk, Bryan Wallman and his wife Sarah of Stamford, Andrew Wallman of Stamford, Christopher Engongoro of Westport, as well as two great grandchildren, Peter and Wilhelmina Wallman. Also surviving is his son in law Samuel Wallman and his wife Susan Klouman of Stamford. Besides his parents, Rocco was predeceased by his wife, Mary Virginia Altieri Engongoro, in 1998; his daughter, Cynthia Ann Wallman, and a brother, Joseph Engongoro. Family and friends may call from 4 to 8 p.m., Monday, Jan. 28, 2019, at theNicholas F. Cognetta Funeral Home & Crematory, 104 Myrtle Ave., Stamford. A funeral procession will be leaving the funeral home at 10:30 a.m., Tuesday, Jan. 29, 2019 for a Mass of Christian Burial to be celebrated at 11 a.m. at St. John Roman Catholic Church, 1986 Post Road, Darien. Interment will follow at Fairfield Memorial Park, Oaklawn Avenue, Stamford.